China’s latest report on economic growth fell short of expectations, but for those who monitor traffic on the global water highways, the news was not a surprise. In fact, freight and shipping data over the last several months have been pointing to such a slowdown. 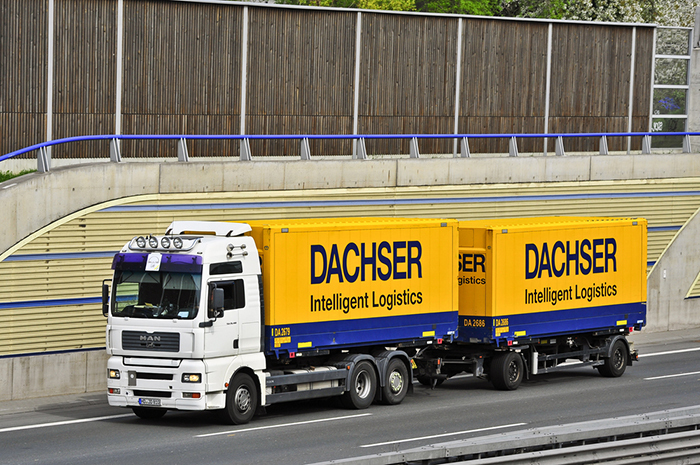 An investor can get an idea of a country’s economic health based on the types of products and the number of containers being shipped to and from its ports at any given time. About 90 percent of the world’s trade in goods is transported in containers on ships across oceans, making maritime activity a key economic indicator. It is also an important indicator for companies like Walmart, the giant retailer that depends on shipping the products it sells from overseas. The Trump administration’s tariffs on $34 billion in Chinese goods went into effect in July. For weeks before that, there was a huge push to import products ahead of the tariffs. Container trade between China and the U.S. from April through June grew 10 percent year over year based on Accenture’s analysis of the Department of Commerce import and export data. This was the container trade in the commodities on the list of tariffs that went live in July. According to the Seabury Global Ocean Trade Database, import volumes dropped significantly after additional tariffs were imposed. 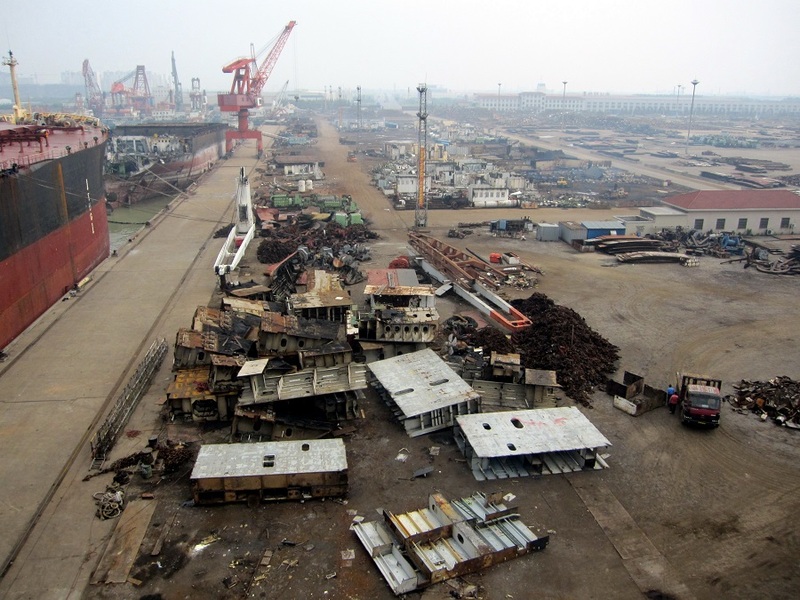 U.S. imports of Chinese steel and aluminum dropped 53 percent after tariffs on those products went into effect in March compared to March 2017, and imports on the $34 billion of Chinese goods dropped 21 percent since the July tariffs went into effect compared to the prior year. Data are still pending on imports of the $16 billion in Chinese goods subject to tariffs as of August and another $200 billion of goods as of September. The effect of the first round of tariffs can be seen by looking inside the Chinese containers being exported to the U.S. 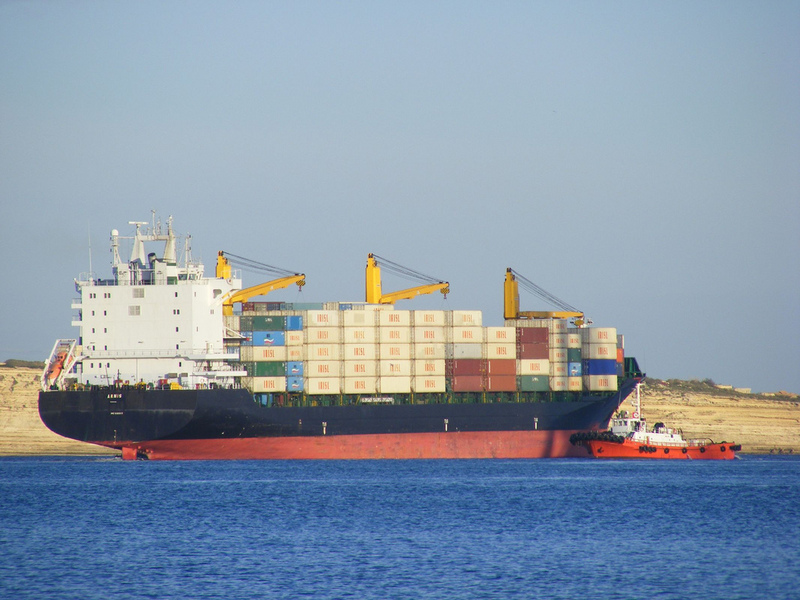 According to Ocean Trade Database, the amount of traded goods included on the $34 billion tariff list dropped 21 percent in July from the year before. For example, the number of transformers imported in July 2018 was 60 percent less than imported in July 2017. 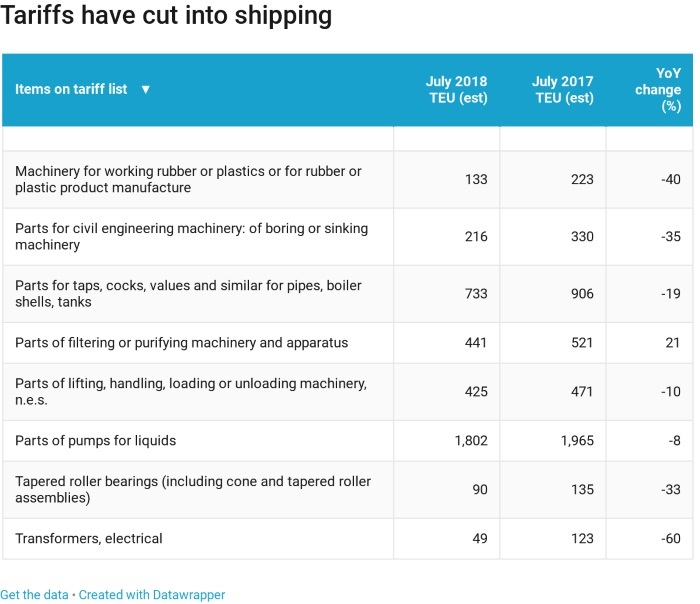 This chart shows a select few items subject to tariff and cargo capacity this year compared to last, as expressed by 20-foot equivalent units, or TEU. Experts say the goods on the tariff list are going elsewhere. In addition to containers, there are other ways to measure the health of a nation’s economy. Demand for raw materials shows up in data on dry bulk (usually small solid materials like coal, grain and iron ore) or tankers (which transport liquids and gases). In September, the DHL Global Trade Barometer lowered its Chinese trade outlook by four points to 59, saying the country is growing but at a slower pace. This barometer’s readings above 50 indicate growth. The forecast is based on Accenture’s analysis of freight and shipping trade flow data. The trade data on the $16 billion tariff that went into effect will be out in November and September’s $200 billion will be out in December.